The tasks are endless - with every day revealing a new load to bear, a new project to complete. You spend your hours on the road, with a trailer forever following. Recently, though, that trailer proves shaky. Its weight is too heavy; its bulk is too great; and your light-duty pick-up can’t sustain the necessary power to accommodate it. Ford suggests seeking a new platform - one crafted from high-strength aluminum. Check out the 2016 F-150 and its redesigned frame! With the release of the 2016 F-150, Ford provides drivers with the power they need. This heavy-duty pick-up boasts peerless construction, blending military-grade aluminum with a fully-boxed steel frame. This (when paired with the signature eight crossmember design) allows the truck to deliver precise rigidity, adapting to every load with ease. It also ensures efficiency, with Ford reducing the F-150’s frame weight by more than 60 pounds. This lessens the engine strain, creating more effective direct-injection responses. The truck can now deliver up to 24 miles-per-gallon on the highway (a 12% increase from the 2014 platform). Power and EcoBoost economy combine. The 2016 F-150 proves the perfect complement to your routine. Allow the Novlan team to schedule a test-drive in this F-Series performer today. Innovation drives the Ford brand. With every year comes a new advancement in performance - with engines redefined, payloads enhanced, and economy strengthened. This year proves to be no exception. In a recent interview with Tech Republic, Ford revealed its last innovation: a seven-camera system for the 2017 F-Series. This collection of high-resolution monitors promises exceptional safety on the highway, enabling drivers to better control their trailering needs. The 2017 F-Series (which features the F-150, F-250, and F-350) now boasts a dynamic camera system. Through seven strategically placed lenses - with three centered at the rear and four placed along the sides - it continually assesses the road, sending real-time data to the central media console. This information enables drivers to immediately respond to all conditions, ensuring seamless navigation and proper lane correction. Through this, Ford is improving highway safety. The 2017 F-Series delivers comprehensive visual monitoring, allowing drivers to make more efficient decisions. It reduces the chance of collisions and delivers early pedestrian detection. Prevention is its cornerstone. The Novlan team is certainly impressed. With the release of the 2017 F-Series, we anticipate safer miles for our customers. It’s been a series of speculations. With the first announcement of the 2017 F-150 Raptor came an endless stream of numbers - with horsepower, torque, and transmission ratios debated by critics and drivers alike. All North American pick-up devotees had opinions to share, and every day revealed a new performance estimation. Those estimations can finally become accuracies. According to Torque News, Ford has finally revealed the precise capabilities of its 2017 F-150 Raptor - and the truth proves far better than any fiction. These numbers promise exceptional performance, with the 2017 F-150 Raptor delivering best-in-class off-roading. When compared to its predecessor - the 2014 model - it offers an additional 39 HP and 76 lb.-ft of torque, allowing it to easily conquer sand, gravel, and deep-rutted trails. It's been tailored for North America's ever-changing terrains, with its 3.0 FOX suspension system ensuring smooth rides and tight turns. Adventurers, prepare: the 2017 Raptor will redefine full-throttle fun, offering twin-turbocharged power to the market. It pairs the utility of a pick-up with the heart of a speedster - and the result is pure adrenaline. To learn more about the 2017 F-150 Raptor contact us today! The rumors prove persistent - weaving through the automotive world, softly promising exceptional economy. 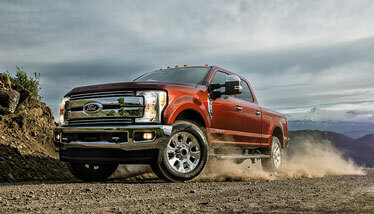 The F-Series, they claim, will soon pair with diesel efficiency; and this will redefine every mile and every payload. According to Road and Track, these rumors are turning into truths. The noted auto-blog recently reported that the 2018 Ford F-150 will feature a diesel V6 engine. This declaration has North American drivers hurrying to dealerships, wanting to stake their claims on 3.0L TD6 performance (the F-Series will share the same platform as the Range Rover Sport, offering a spirited 245 HP and 440 lb.-ft of torque). With the promise of a V6 diesel engine, Ford is pushing its 2018 F-150 to the forefront of the pick-up market. Only one other competitor - the Ram 1500 - offers this alternative platform option, creating a need for improved economy. 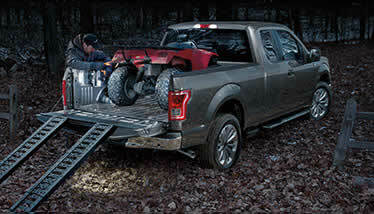 The F-Series will now fulfill that need, fusing its best-in-class trailering with an estimated 28 miles-per-gallon. This will ensure precise power on both the highway and the back-roads. The 2018 F-150 will provide drivers with the V6 reliability they crave - and we can’t wait to sample that reliability next year. To learn more about this and other F-Series models contact us today. It’s a tradition of excellence - with the Ford F-150 Raptor dominating every backroad, stirring silt and sand as it roars across North America. Since its 2008 arrival, this all-terrain beast has proven itself a worthy successor to the F-Series. Its rare fusion of V6 performance and EcoBoost economy has allowed it rev past all competitors, providing drivers with unforgettable adventures. These adventures will continue in 2016. According to CarScoops, the 2017 F-150 Raptor will offer dynamic responses - generating 450 HP and 510 lb.-ft of torque when purring at 3,500 RPM. These numbers showcase the capabilities of Ford’s signature EcoBoost engine (a spirited 3.5L V6), promising exceptional off-road experiences. This F-Series variant will effortlessly power through sand, mud, and muck. It will also offer power. CarScoops notes that the 2017 Raptor will deliver up to 8,000 pounds of trailering. This will allow drivers to take all of their beloved ATV and UTV toys along for the ride, with best-in-class payloads promoting ease with every mile. No official release date has been given for the F-150 Raptor. The Novlan team anticipates a speedy production schedule, however, as the year comes to a close. This pick-up speedster will soon rev onto dealer lots across North America - and deliver unprecedented capabilities to drivers. To learn more about the 2017 Ford F-150 Raptor contact us today. It’s a series of stops and starts - with your truck locked in a trailering struggle, trying to maneuver its massive frame to that tiny faraway hitch. You sigh, frustrated by both a lack of progress and the inevitable crash. You know this will end with a scratched tailgate. Ford wants it to instead end with success. That’s why it recently fused its 2017 Super Duty with an autonomous trailer back-up system - allowing drivers to effortlessly (and precisely) navigate every scenario. According to Motor Trend, the 2017 Ford Super Duty delivers impressive performance. Within its aluminum frame are seven carefully positioned digital cameras - which constantly assess the road for unexpected obstacles and potential collisions. These cameras then relay information to the truck’s central media system, allowing drivers to examine every angle. When paired with a variety of technological advances (including dynamic back-up guidance lines and jackknife warnings), this real-time function promises easy trailering. 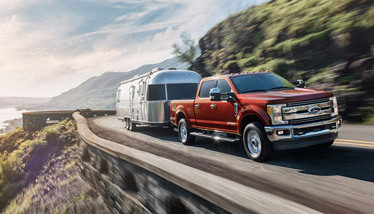 By examining the road, the F-Series can more effectively create custom routes - using its adaptive cruise control to seamlessly connect to a hitch. This spares drivers the frustration of gauging distances... and it also spares them the horror of dings, dents, and sudden damage. We’re certainly thrilled - aren’t you? To learn more about the 2017 F-Series and its autonomous back-up system contact us today. The numbers are inconstant - a series of highs, lows, and middling in-betweens. Fuel costs leave drivers frustrated, constantly trying (and failing) to gauge potential expenses. The dollar never remains stable... and it never seems to stretch quite enough. Ford understands those maddening fuel demands. That’s why it recently fused its signature F-Series with a supersized gas tank! According to Motoring Crunch, the 2017 F-Series will feature a 48-gallon gas tank. This proves quite the upgrade, with previous F-150, F-250, and F-250 models only offering 37.5-gallon capacities. The increase will now allow drivers to experience enhanced mileage on the road, demanding fewer pauses at the pump (and fewer dollars spent). This will provide North Americans with the budget-friendly efficiency they crave - but don’t fret about a loss of power. Motoring Crunch notes that the 2017 F-Series will still deliver best-in-class performance, boasting a rugged 6.2L V8 engine and HP ratios of 385. Exceptional results await on every road. What do you think about the 2017 F-Series’ tank change? Will it provide the economy you need? Share your thoughts with the Novlan team today! Tradition drives the Super Duty - with every F-150, F-250, and F-350 drawing inspiration from the platforms that came before them. Familiar profiles line every dealership, and Ford’s 2017 models will be no exception. Each promises classic heavy-duty styling, with strength emphasized through wide fenders and elongated cabs. Drivers craving a dynamic design experience, however, will soon discover much to celebrate - because Ford is pairing its 2017 Super Duty with a bold new look. Body-Colored Front and Rear Bumpers. All STX details perfectly complement the 2017 Super Duty, emphasizing its signature frame; and, to further ensure convenience, this package adapts to all F-Series configurations (including Standard Box, Crew Box, and Long Box). This allows drivers to create dynamic looks with ease. The STX package will be an exclusive Ford option. To learn more about it (as well as the 2017 Super Duty) contact us today. It’s the summer of pick-up performance. The 2017 Ford F-Series will soon arrive on the market, delivering best-in-class power to drivers across North America. This heavy-duty behemoth - with its 6.7L V8 turbo diesel engine, 440 HP, and 925 lb.-ft of torque - promises exceptional results on the backroads. It also promises a mad rush to dealerships, with drivers scrambling to test the adaptive cruise control and exclusive Trailer Reverse Guidance system (which utilizes four digital cameras to assess, and respond to, changing terrains). The 2017 F-Series will prove popular in both Canada and the United States. Ford wishes to lessen the strain of those test-drive scurries. This is why it recently launched a 29-city promotional event, bringing the F-Series to North America. 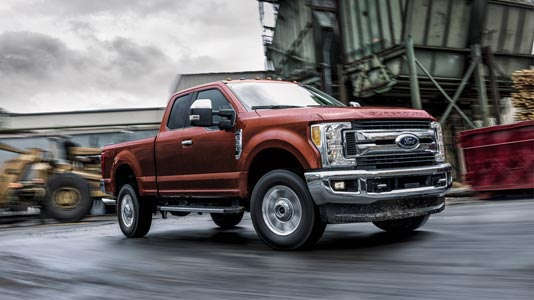 According to Edmunds, the F-Series line-up (including the F-150, F-250, and F-350) will be revving its way from capital to capital, connecting drivers to 32,5000 pounds of gooseneck towing, 27,5000 pounds of conventional towing, and 7,630 pounds of payload capabilities. These numbers showcase Ford’s dedication to performance, promoting all-road adaptability and seamless power. The 29-city event will allow men and women to now access that power, providing closed-course test-drives. Sample the full-throttle roar of a turbocharged engine. Interested in participating in this event? Click here to learn more about upcoming locations and sweepstakes opportunities. Be sure to contact the Novlan team with any questions or comments as well. In the distance is a wave of dust - fanning high across the horizon, pushing toward the sun. It billows out in long dirty waves, rippling from the steps of a V8 beast. Drivers watch in anticipation, slipping out of their cars to gawk at the all-terrain monster that approaches. They’re not disappointed - because the 2017 F-150 Raptor Baja rumbles by, spitting sand and mud with every engine revolution. It’s big; it’s bold; it’s... perfect. The 2017 Raptor Baja is an exceptional pick-up, designed for heavy-duty escapes. Through signature V8 performance, it races through every environment - propelling drivers toward best-in-class power and full-throttle fun. Check it out! With the impending release of the 2017 Raptor, Ford is redefining the pick-up market. This F-Series option delivers incredible performance, offering drivers access to exclusive Terrain Mode technology - which allows it to seamlessly adapt to every road, boasting six unique navigation options: Normal, Sport, Weather, Mud and Sand, Baja, and Rock Crawl. These options ensure improved stability, shifting the truck’s transmission and steerage responses as needed. Through this, drivers can quickly overcome even the most volatile environments - trusting the Raptor Baja to guide them toward adventure. The Novlan team will certainly take advantage of that. Are you as excited about this F-150 powerhouse as we are? Share your thoughts about the Raptor Baja!